In this series, you can also get books for learning Spanish, French and Italian. TL;DR: I'm impressed with the design, structure and method used by these books. They're awesome, if you're anywhere between A1 and A2 pick up a copy and use it to practice. Also looks like a good potential Christmas present. If you read language articles on the internet, you've probably come across Benny Lewis. He runs the website Fluent in 3 Months and has been blogging and learning languages for over 10 years. Benny has previously published a book with a real publisher, which is an inspiring thing for all of us language bloggers. More importantly, he brings a more modern approach to language learning into book shops. I'm very much on board with that! This particular series, "Language Hacking", is a collaboration with Teach Yourself, whose materials have always been language learner favourites. I've checked these courses out and used them, and they're definitely one of the best brands for self-teaching materials on anything. My first impression was that this book is really good-looking! It's got a nice size to it, the design throughout is engaging and interesting, and it just feels very nice to hold in your hands. You can see straight away that they're trying to make #languagehacking into a thing, so the message is clear: This book is for 21st century learners. The structure of the book follows that of a traditional self-teaching language book, so it's not trying to overthrow everything good in the system. The design is lively and engaging, with vocab delivered in sentence structures, culture tips, conversation examples and exercises. It's a great "complete package". What's different here is that this focuses very much on conversation as the goals and "learning outcomes". The book avoids mentioning grammar concepts in favour of setting the learner a mission with every unit. What I really liked is that each unit clearly sets out the mission as a use case, describing what kind of situation you would find yourself in when you will use what you are learning. In each mission you learn some new stuff, and there are exercises so you can test that you learnt it correctly. The #languagehacking system adds in Benny's "Conversation Countdown" methods of building a script and sharing it immediately with a dedicated web area sponsored by italki. The design is all about making language learning less intimidating. I hardly saw any grammar terms mentioned, with focus on descriptions like "slingshot words" instead of "subordinating conjunctions". In fact, this style combined with the mission and scripts system feels perfect for new learners, but also for experienced learners as they'll be able to breeze through this and create sentences quicker. The brand "Benny Lewis" is present throughout the book, and that worked really well for me. As you work your way through it, you get to feel as if someone is on the journey with you and guiding you through this course. The quotes and images of Benny were a fun addition - I'm not a fan girl, but as a structure this worked very well for me. Each mission mentions a small #Languagehacking tip in the introduction - a great concept. As you're learning your new language, I can imagine how much these little tips will help you build more confidence and feel ready to speak quickly. The book doesn't solve a key problem of language learning, which is the idea of being too busy. It's written with "conversations with natives" in mind, so if you're learning languages without immediate travel plans you may feel cut off from many of the examples. The scripts system is also nice, although I would prefer to make my own -- this is because I'm experienced and relatively "fearless" as a language learner, not because the idea itself is bad. If you're a very long-standing Fluent reader, you'll have read my thoughts on the use of the word "hacking" in the context of language learning. I'm not a fan of the name of this series, but the "language hacking" brand is what Benny Lewis has used for years. The tiny things are exactly what makes this so good for more inexperienced language learners. They were nitpicks, really - overall this is an impressive product. At first I grumbled that there is no CD with this book, but I quickly remembered that we live in the 21st century and all the audio is downloadable. So it does come with audio, and the example sentences I heard were very good and match the book scripts excellently. You can get the audio from www.teachyourself.com/languagehacking. Overall, this is one of the most impressive versions of a language course I've seen in a while. The way that it incorporates "hacking" ideas (I'll just call them shortcuts) into a traditional self-teaching book design was fantastic. 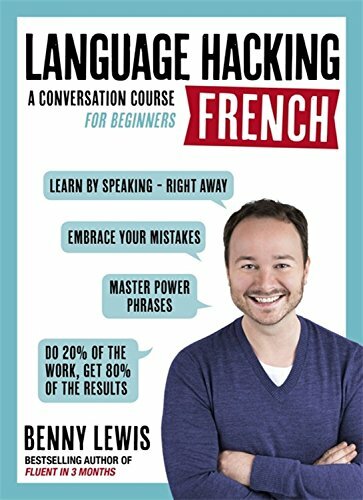 These Language Hacking courses are an incredible addition to the bookshelves of any language learner, but particularly for those that are new to the language. Overall, a clear 5/5 - kudos to Benny Lewis and Teach Yourself. This is not a grade I give readily at all, so you can trust that this course is well worth your investment if you want to learn a new language. I hope they publish more versions soon. The links below are affiliate links, so you'll be supporting Fluent at no extra cost to yourself. Go ahead and click to take a look! Having seen the printed copy of this book (but not the kindle version), my feeling is that you are best served by investing in the print. The prices are currently very similar, and you'll be able to take notes and write in your book, take it everywhere and share it easily.